What a board can be about is only limited by US law, and thus boards like /homosuck/ (homestuck), /furry/, and /baphomet/ (because /b/ wasn't edgy enough) have been created as a result. However, subthreads like /agdg/ (amateur game development) have also been spun off into their own boards. Some of the top boards like /pol/, /a/, /christian/, and /v/ have potentially controversial moderation. A lot of the site's userbase are GamerGate supporters, and stormfagging and discussion about SJWs are both common. 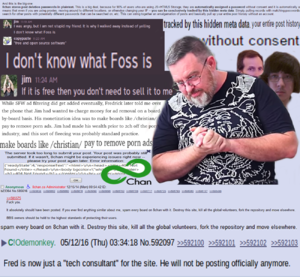 8chan's /sp/ loved to go around and steal other boards' GETs as a sport. Many 8channers have a near pathological obsession with GETs and dubs and almost no board discourages them. Some time ago, however, all of /sp/ moved to other imageboard sites, and so their hunt for GETs ended quite a while ago. The community is still new and forming its own identity. Expect to see similarities and similar images between 8chan and 4chan. Hotwheels once released the Private key to the Tor site, causing him to have to re-register the onion domain. He accidentally copied and pasted it into the IRC channel #8chan. The Tor service has been down many times because site owner Jim Watkins does not like the anonymity. Infinity Next started development in mid-2015. 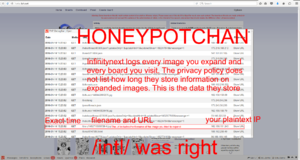 Designed by 8chan co-owner Josh (n-tech), it was to be the fix for the problems with the previous board software, simply called Infinity. 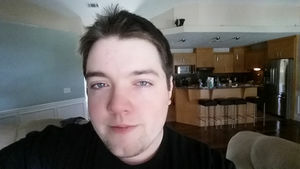 However, Josh betrayed both Hotwheels, and the userbase, and instead of improving the existing code he decided to follow-through with his "vision" of bringing a modern era into chans. Repeatedly, Josh showed his arrogance with coding, and after several failed attempts, one after another, to migrate the main site into the Next software, he kept pushing the "official" release date. A number of new chans were made as proposed alt-chans, most notably Endchan. Infinity Next was nicknamed Infinity Never.